When the New York Times turns the page on 2014, it will leave behind a bumpy year that included a high-profile firing, setbacks with digital innovation and, most recently, the elimination of 100 newsroom positions. The year hadn't quite reached the half-way point when the Times was rocked by an abrupt leadership change in the newsroom. Jill Abramson, who had become the paper's first female executive editor in 2011, was sacked in May and immediately replaced by Dean Baquet. Baquet became the first African-American to hold the paper's top editorial job. Abramson's firing was reportedly prompted by her secret efforts to poach The Guardian's Janine Gibson to serve as a joint managing editor. Gibson said she turned down Abramson's offer, but the move angered Baquet and Times publisher Arthur Sulzberger Jr. The Times also took heat for Abramson's ouster after it was reported by The New Yorker that she had been paid less than her male predecessor, Bill Keller. Sulzberger denied that report. The day after Abramson's firing was announced, another bombshell landed when BuzzFeed obtained a nearly 100-page internal document that underscored the Times' struggles with digital. New media outlets such as Vox and BuzzFeed, the report said, "are ahead of us in building impressive support systems for digital journalists, and that gap will grow unless we quickly improve our capabilities." "We are not moving with enough urgency," the report said. By the summer, some of those digital struggles came into clearer focus. As Re/code reported, the Times "hit the low end" of online subscribers in June. The same report indicated that the 32,000 bump in new digital customers the Times added from April to June were mostly for the NYT Now app, which offers a cheaper, smaller version of the paper. The NYT Now app is still available, but the same can't be said for another mobile product put out by the paper this year. In October, the same day that the Times revealed its plans to cut 100 newsroom positions, the paper also announced that it would shutter an app that had been launched only four months earlier. The Times said it pulled the plug on NYT Opinion, which provided access to the paper's op-ed content for a cost of $6 every four weeks, because the app had drawn a disappointing audience. NYT Now, the paper conceded, had also not met expectations. The planned layoffs come after the Times initially sought voluntary buyouts from newsroom staff. Dozens of veteran Times journalists, including longtime television reporter Bill Carter, took buyouts, but the paper still fell short of its target number of 100. The Times said that it accepted 57 buyout applications from union members and 30 more from nonunion employee. On Tuesday, the Times began layoffs of at least 21 more. The cutbacks will ultimately take the Times from a little more than 1,300 newsroom employees to around 1,200 employees. Baquet said the layoffs marked "the end of a painful period for the newsroom." Times reporter Richard Perez-Pena, who serves as vice chair of the Newspaper Guild of New York, the paper's primary union, expressed his sadness over the exodus on social media. "Heartsick over departures (voluntary & not) of so many colleagues who are great journos, great friends. Love you all & wish you good things," he wrote Wednesday on Twitter. Compounding matters for the Times is a bleak financial forecast. The company informed investors in October to brace themselves for a dip in fourth quarter ad spending. That prompted the company's stock (NYT) to fall by 6%, and its shares have fallen more than 17% in 2014. Advertising accounts for 40% of total revenue for the Times. 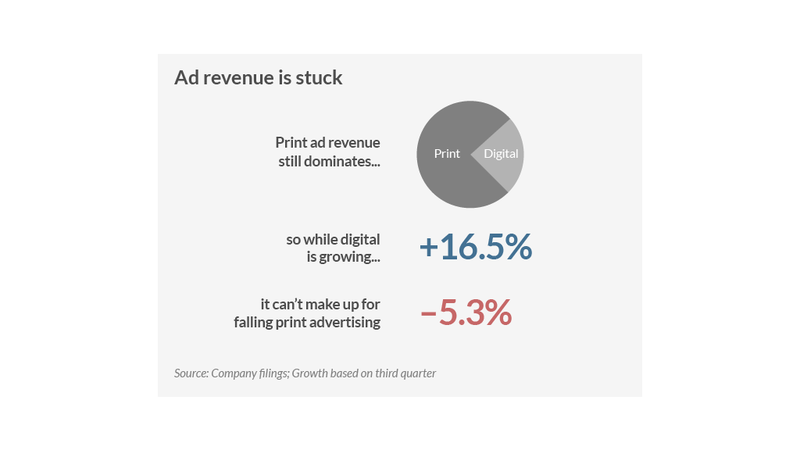 The third quarter saw a 16.5% jump in digital advertising for the paper, but print advertising fell by slightly more than 5%. Add it all together, and it's no wonder why Times reporter Ravi Somaiya characterized 2014 as a "tumultuous year" for the Times. Baquet, however, focuses on the journalism. "Actually I don't think the tumult has defined the year for The Times," Baquet told CNNMoney in an email on Wednesday morning. "I think that's a media centric view of the year." Rather, Baquet said the paper has been defined by its reporting on General Motors and the auto industry, the torture report and the Ebola crisis, among other stories. "The year for The Times has been defined by remarkable coverage of what has been a remarkable news year," he said in the email.